I had several incidents that led up to the beginning of my weight loss journey. My beloved grandmother died in late January, 2011. At the funeral, a cousin asked me, “What are you going to do now, Miss Borawski. Who’s going to pray for you now that grandma is gone?” I blurted out, “I’ll tell you what I’m going to do. I’m going to WALK again.” Sounded good, but how? 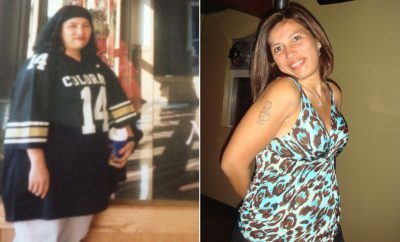 I weighed 428 pounds and was in a wheelchair or wheeled walker. They were just words I blurted out in grief, or so I thought. I decided if he couldn’t do anything for me, I had better do something for myself, but wasn’t sure what. I hadn’t been on a diet in years. I was more than 200 pounds overweight, and couldn’t even walk to my mailbox. What was I going to do? Three days later, a conversation with my sister was the final catalyst needed to start me on a journey that would change my life completely. I decided that I no longer wanted to live a life of pain, sadness, and immobility. On March 1, 2011, I weighed 428 pounds. That evening, I had a phone conversation with my sister. She called that evening to tell me that she had scheduled a date to have bariatric weight loss surgery. I expressed my fears and concerns about the surgery and begged her not to go through with her plan. I told her that there must be another way, but she had already made up her mind to proceed with the surgery. Unable to convince her, I hung up the phone and immediately said out loud, “I’m going to show you! There is another way!” At that moment, something clicked in my mind, and I never looked back. By Labor Day I had already lost 100 pounds, and another 58 by Christmas. By March 1, 2013, I had lost a total of 275 pounds and I have not looked back! After hanging up the phone with my sister, I opened the refrigerator and noticed that I had six 2-liter bottles of soda in there. A quick calculation told me that I was consuming close to 1,000 empty calories per DAY with my soda addiction. I began by emptying the bottles down the drain. Next came the sugar bowl. The next day I went to the store and purchased low calorie bread, fruits and vegetables and I purchased a calorie counting book. I began to count calories and completely cut out junk food, sugar, and sweets. For the first couple of weeks, I switched to diet soda, but a few weeks later, I was drinking only water with sugar-free flavored packets. I was unable to do any exercise because I was immobile and could not walk or stand for more than a few minutes at a time. After losing the first 100 pounds or so, I began to take a few steps at a time, increasing my distance each day, until I was able to walk a mile. November 1, 2012, I walked into a gym for the first time in my life and learned to use the treadmill. It was quite an experience! Now I can walk 2-3 miles without difficulty. It sounds a bit strange, but one of the biggest challenges for me was the high cost of purchasing fresh fruits and vegetables and nutritious food. I was consuming only about 1000-1200 calories a day and eating a whole lot LESS food, but my grocery bill increased dramatically. I used to eat junk food, processed food, boxed mac and cheese, Little Debbie snack cakes, etc. and was surprised at the cost of good, wholesome food. Another challenge was keeping myself in clothes that fit! I was losing weight so rapidly that I was continually out growing (in a good way) my clothes. Every month or so, I was in a smaller size, dropping a total of 14 (size 40W to a misses 10/12) sizes. Thank goodness for thrift stores like Salvation Army and Goodwill! Learning to realize that I am worth it and making my physical wellness a priority took time. As unusual as it sounds, giving up was never an option for me. My main motivation was to WALK again without a walker or cane, and to get out of that wheelchair once and for all. That, along with the determination to show my sister that I could do it, kept me going on days when I wanted to eat a bag of chips or a candy bar. I was fortunate in the sense that I was losing weight at a rapid pace and was seeing great progress on the scale each week so it was easier to stick with it. The more I lost, however, the slower the pounds began to come off and it was harder to stay focused, but by then I was becoming more physical and walking on my own so I was determined to get stronger and do more things. There were only a couple of times when I actually reached a plateau. One time was for three weeks. That was really tough. It was so hard to keep doing the right thing and not see any results on the scale. I knew that as long as I was doing what I needed to do, that the results would eventually materialize, so I just kept doing it, and sure enough, a few weeks later, I began to lose weight again. Now that I am trying to maintain my current weight, I’m thrilled with a plateau! I don’t want to see the scale going the other way! And don’t weigh yourself every day. I can gain 6 pounds overnight and stay completely on plan. Weight can fluctuate for a number of reasons; don’t become a slave to the numbers. Exercise was never been a part of my life, before or during my weight loss. I don’t like it and I absolutely hate to sweat! Dieting without exercise goes against all the weight loss theories, but I just don’t like it. But, I knew increasing physical activity was critical to good health, so I began to make an effort to add some physical activity to my routine. I just don’t call it exercise. I suffer from rheumatoid arthritis and at the beginning of my journey, I was confined to a chair and couldn’t even walk to my mailbox. Traditional exercise was out of the question, but I began to lift some light weights while sitting in my La-Z-Boy. 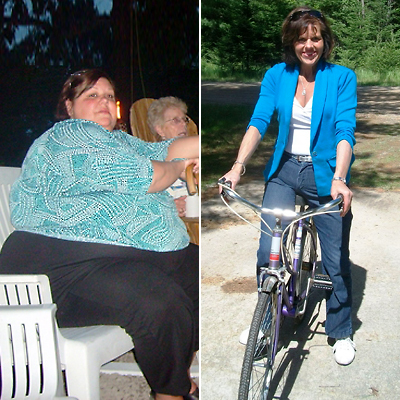 After I lost about 100 pounds, I was able to gradually move from the wheelchair to the walker. I would use the wheeled walker to walk a few steps in the driveway, stopping to rest every few steps. I would try to go a little farther each week. Eventually I was able to use just the cane and then to walk freely. Last winter I walked on a treadmill at the gym a few times a week. Now I do squats, lift heavier weights, ride a bike, walk a few miles several times a week, and garden. I just plain live life. Someday I hope to learn to dance. My physical activity, although not necessarily called ‘formal’ exercise, comes from doing what I love to do and doing things I never thought I could. I eat oatmeal for breakfast every day. For lunch, I have either a can of low-calorie soup or Greek yogurt and fruit. Sometimes I’ll eat a protein bar or Fiber One bar if I am still hungry. Snacks include an assortment of yogurt, fruit, rice cakes, or protein bars. I absolutely love watermelon! For dinner, I eat chicken, turkey burger, pork, and a lot of vegetables and salads. I really like stir-fry. I eat very little bread or pasta, but will use the low-calorie whole grain bread once in a while to have a turkey burger or sandwich. With apples in season now, I’ve been enjoying baked apples with a bit of sweetener and cinnamon. I enjoy Greek yogurt, fruit, rice cakes, and protein/fiber bars for snacks. I like to make a turkey burger and bean mix for a high-protein/high fiber meal that is very filling. On occasion, I’ll buy a bag of those popped rice-cake snacks if I get the munchies and others are enjoying chips or pretzels. One can’t be tempted by things that are not readily available so just don’t buy it. If you don’t have junk food, sweets, or high-calorie snacks in the house, you can’t eat them. Stock your refrigerator with good, wholesome food and carry nutritious snacks with you everywhere so when you get really hungry, you have no excuse to eat things that are not on your plan. And, always be prepared. Don’t go out to dinner if you haven’t already made a plan as to what you are going to order. Check the menus online or speak to the chef about a low calorie substitution. Bring your own salad dressing with you in a small bottle and plan ahead for parties and other social gatherings. Don’t let, “I didn’t have to choice – I had to eat something be an excuse. I am a completely new person. I have never been an average sizeed person and at age 50, I feel like I am living life for the first time. My health has improved dramatically and I no longer need so much medication to get through the day. My blood pressure has normalized, my cholesterol has dropped, and my dependence on high potency pain medication for the RA has decreased. I will always suffer from the arthritis, but being active and mobile has helped a lot. This summer I purchased a bicycle and climbed a dune. I am doing things I never dreamed possible and I am happier and healthier than I have ever been in my life. And clothes – well, I love being able to wear fashionable, form-fitting clothes and heels! Three years ago I was considering selling my home to move into an assisted living facility because I could barely take care of myself. Last week I went fly-fishing for the first time! Life is very, very good and I am incredibly blessed! My main suggestion is: Don’t go on a diet, but rather make choices that you are willing to do EVERY DAY for the rest of your life. People go on and off diets all the time. Think of your new life as a journey, one that you will never go off. I knew on day one that I did not want to go the rest of my life drinking black coffee, so I switched to sugar-free French vanilla coffee creamer and Splenda. Don’t give up something that you are not willing to give up for life. Instead, incorporate the calories into your allowance and make cuts elsewhere. If you know that you could never give up chocolate for the rest of your life, replace that daily candy bar or hot fudge sundae with a snack size bar or three Hershey kisses before bed. Don’t go on a crazy fad diet or use diet pills because as soon as you go off of it, the weight will return. Instead, make choices that you are willing to make for Life. Ihave been working with West Chester Hospital Weight Loss Clinic for the past several months to meet Insurance requirements of several months of weight loss medical supervision. Then after I get on Medicare in December when insurance will cover it, I plan on having the surgery if feasible. Yes, I do have hope now. Nan this is a fascinating story. She was wheel chair bound. If only I could lose 50 bls. Way to go girl. Congrats!!! Amazing story. ..so pleased for this lady..
You are a true inspiration! Truly amazing! What a great story. But I have to ask what did you do about the excess skin with your weight loss? Congratulations to you Theresa!! I’m 50 yrs old too and have over 100lbs to lose. Thank you for sharing your story!! What a fabulous story. I need to lose about 30 lbs and find myself wondering where do I start. Your story is very inspirational!!! Oh my goodness! I loved this story. I’m glad to see that she saw there was another way other than surgery and succeeded! I’m just in awe of her. Congrats! What an amazing story thank you for sharing! This gives me some new found hope! 17 months ago I was on oxygen 24/7, could barely walk to the car, wasn’t able to do anything for myself…literally. My mother was diagnosed with liver disease and I was all she had. I had to make some changes and fast! I weighed 473lbs and had bariatric surgery because I knew I could not do it on my own so very proud of you that you were able to this without the surgery! Today I am 293lbs! I walk 2 miles a day, off the oxygen and today I start 2 month weight lifting challenge! The path to weight loss, no matter the one you choose, is never easy but everyday when we make that choice the path tends to even out and any obstacles along the way get easier to deal with! Well done I say! Thank you for helping understand that there a many different ways to achieve our goals and that there is always someone out there to keep it going!!!! What a great story !! You look wonderful !! I am sure your story will inspire many people as it has just done for me !! Thanks for the inspiration! Awesome story. Wow!! Amazing job!!! I needed to read this today. I am also interested in what happened to the sister? Good for you Theresa, you look so great and I know you must feel even better. I think people take being able to walk for granted when we really shouldn’t. That is amazing!!! What a change in the quality of life too. I’m blown away! Love her determination and her energy. Good for her! I’d love to know what those “good meaning” relatives think of her now. Great story! I would love to know what happened with the sister. Did she go ahead with surgery? Excellent success after hard work and determination! Impressive! So awesome. Congrats to you on your amazing accomplishment. Wow!!! Exactly what I needed to hear today. I don’t believe in coincidences. God wanted me to hear this story. I’ve been struggling all my life with weight issues and most recently with rapid weight gain after having a lap band removed. She is s true inspiration!! I love these stories! Good for her!! Wow! What an inspiring story! I need to go clean out my refrigerator and pantry now. 275 lbs is a lot of weight. Congrats to the lovely young lady, why is everyone so down on bariatric surgery ? Isn’t good that someone morbidly obese finds a way to help them, if it’s healthful ?? WOW…Thanks for sharing my story!!!!! What a privilege!!! Hard thing to do. I commend you. Thanks! It was hard to lose the weight, but in all honesty, the hardest part is keeping it off. IT’s a life-long journey. I love it…but why is there such a stigma about weight loss surgery? Stories like this is why I love this Facebook page. So happy and proud of hours! Awesome sauce! Beautiful and courageous woman she should be proud!II’m also losing weight without surgery using myfitnesspal! “Weigh” to go Theresa!!! What a truly powerful, inspiring and motivational testimony!! Awesome !!! Thanks for sharing !!!! Loved this story! You look amazing. Congratulations Theresa what you did was incredible! Mandy Lynn Sanchez, depending upon age with loose skin, you could exercise those areas by lifting weights bicep curls, triceps dips, hip adduction/abduction for thighs, and as you are doing cardio to lose pounds all around, you can do as many abdominal crunches of different variations to work all areas of your abs, but they say that planking works best for tightening the abs. I hope this helps. So amazing!!!! A true inspiration!!!!! I do have some questions though. I myself have around 100 to lose. What about excess skin? Will I be able to wear a bathing suit? If skin is a big problem, will I be able to hide it under cloths or will it still be evident? I’m asking bc in your pic you’re absolutely radiant!!!!! I only see a super strong beautiful and courageous woman!!!! I absolutely LOVE this…the like button isn’t big enough!! Congrats. ,..you have encouraged me! Melissa, I didn’t mean that to be rude to anyone. What I mean is often people don’t even try to do a lifestyle change. I agree some can’t but it should always be an option before surgery. Congratulations on your weight loss! Very inspiring story, and I must say you are beautiful and don’t even look 50!! Thanks! I don’t feel 50, but I sure look like it close up! Too many years of sunshine….I can’t help it, I’m a sun-lover, but getting wrinkled up as a result. Still, it’s been way below zero here in Michigan for months….can’t wait for the warm weather so I can get out and ride that bike and feel the sunshine on my face. I agree Krista Thompson!! People need dont FORGET case by case! Theresa, that was very inspirational. I am 2 pounds away from lossing 65 pds. I feel great. I’ve always wondered, 275 lbs. is a lot of “excess” I wonder if she had to have skin removal? She looks great! I have a tremendous amount of excess skin. It is probably the worst thing about the weight loss. I have a hard time looking at it myself, but after consulting with a surgeon and discovering that it would take four separate surgeries and months and months of recovery, not to mention the $80,000 price tag that my insurance won’t cover, I have decided that I will have to find other ways to cope with it. The extensive scarring and risk involved in that many incisions makes the surgery as unappealing as the skin. Since I’m enjoying this newfound life; I don’t want to spend two years of my remaining time on earth on surgery and recovery. Fortunately, they have great products on the market in the form of shapewear and Spanx! Thank you for sharing.. I just had to share your good news. Thank you, Penny, for your kind words. I hope to write a book someday, but for now I’m writing a blog to share my thoughts. My posts are in my Facebook group: WE CAN CHANGE OUR LIVES. Best wishes to you on your journey to better health, however you define that. Amazing! You should be so proud!!!! Ditto Krista and Belinda! You know what they say about people who ASSUME things! Never judge…. I’ve sent from having 6 or more a day to maybe having only two ( caffeine head aches ) now drinking more water than I ever have! Wish I could get all of my diabetic patients to read this. It could absolutely change lives!! She is beautiful! I joined weight watches back in oct n have since lost 52lbs with much more to go but Theresa is right it’s not a diet it’s a lifestyle change. 🙂 congrats to you Theresa! I hope you become an inspiration to ppl of all ages genders and sizes! THANK YOU for your kind words. I hope that sharing my story will inspire someone….even just one person…and give him/her hope that life could be different by making just small changes a little at a time. Norma Smith, check this out!! Great success story, I’ve struggled all my life and when i hit 40 it became very difficult to lose the eight, i am trying the Isagenix program and did great the first 2 weeks then got off track. I started exercising again but found out I’m not able to do what i want due to severe knee pain,.. I really need some advice in working out and ferrying this cellulite off my thighs without continuing to experience the knee pain, is there any way?? Awesome!!! You inspire me to keep going! I connected with your story in a couple of ways. Congratulations! One day, my before and after picture will be shared too! I look forward to seeing those pictures, Sarah!!!! You can do it!!!!! Never stop believing! You’ve really inspired me. Thank you! Extremely powerful and motivational detailed change of lifestyle Q&A! You are a powerful and strong woman in more ways than many can imagine. I hesitate to judge others who elect for surgery because I have not lived in their shoes. If they “are so quick to run to surgery” respectfully Sasha Alexandria Ozment, they will be the ones who have to deal with it if it was the wrong decision. Surgery, in my opinion, is a tool for some that need it, not the solution. If you look at the beautiful & strong woman Zsalynn Whitworth, she is an amazing woman who is and continues to lose weight and LIVE LIFE, using that tool and making lifestyle changes. I look up to her. I’m hoping to meet her someday, if I would be able to catch her. LOL There are some amazing people on “My 600 lb Life”!! I’ve heard people say to stop eating crapy and fast food… How do you know how the shoes feel on your feet if you’ve never tried them on?! Sasha that’s not always true, I had WLS surgery two and a half years ago!! It was the last resort for me after trying to do it on my own for so long. So don’t always assume it’s because people don’t want to make a lifestyle change. You still have to make a lifestyle change even after the surgery…surgery is a tool not a quick fix! I’m at 210lbs lost, all natural, diet and exercise. It can be done. Very inspiring. You go girl !!! So great! So many people are so quick to run to surgery because they don’t want to make lifestyle changes! Very inspiring!!! I like the foods you are eating, I won’t give up my light & sweet coffee, I am 50, I hate sweating and I love watermelon! And you started on March 1st and I found you on March 1st! It can’t be any clearer to me that I will do what you do and get to a healthy weight too. Could you tell me though, do you have excess skin from the weight loss? My weight now is abt 180 and I’m 5’2″ so my healthy goal is abt 130. I wonder if I’ll have a sagging…well, everything when I slim down. I don’t believe it was any coincidence that you found my story on March 1st; those kind of things don’t just happen! Thank you for your kind words. Yes, I have a tremendous amount (probably about 15-20 pounds) of excess skin. It is actually one of the worst side effects of the weight loss. There are days when I cannot stand to see myself naked and it bothers me terribly, not necessarily physically with infections or anything like that, but rather it’s just psychologically difficult. I’ve explored the option of surgical removal but the surgery is very extensive and would need to be done in four separate surgeries over a period of two years with very long recovery times and horrific scarring everywhere. I’ve decided that the risk of the surgery, the cost involved in both monetary resources and time (giving up 2 years of my life), the scarring, and possible complications just isn’t worth it. SO….for now, I just try to accept the skin…EVERYWHERE…..as a sign of victory and reminder of the life I used to live, and hope that someday I’ll find someone that will love the inside Theresa and not be turned off by the skin. AND…thank goodness for products like SPANX! The new line of shapewear out there is awesome and does a great job hiding it. Thank you for allowing me the opportunity to share my story on your website. In doing so, I hope that others who are struggling with weight or other issues will be inspired and encouraged to make changes in their own lives. Nothing is impossible! Best wishes to all your followers. I’m very proud of you Theresa. I can totally relate to many of your struggles and issues over the last few years. I appreciate you sharing your story for others!!! I myself was almost 500# a little over 2 years ago and now am at 260# and now enjoy life like you should. I think you found some of the big hidden issues many face that are overweight, which I believe sugar is the #1 issue we face today! Thanks! I hope to write a book someday. Until then, I’ve been sharing my thoughts on my blog: Theresa Doesn’t Live Here Anymore or my facebook group: WE CAN CHANGE OUR LIVES. I’ve always believed that this was a JOURNEY rather than a diet. People go on and off diets and the word “diet” implies that it something that you will follow for a period of time, until you lose the weight or give up; whichever comes first, whereas a Life Change is permanent. Don’t do something today or give up something today that you are unwilling to give up for the rest of your life. You can do it…one little thought…one little step….one little pound at a time! Never give up believing!